I was a bit in the dark about Alice.com and since I don't live in the US, I didn't have much of a chance to try this service out. So as a disclaimer to this review, I don't live in the US and I don't use the services provided by Alice.com. I did however try out their new iPhone app, and will recommend it wholeheartedly. Just to recap a bit, Alice.com is an online retail platform that's aimed at linking manufacturers of household items like tooth brushes, toilet paper or trash bags to consumers directly. You can set up an account (free of charge) on Alice.com, and you can select the products you use the most. Alice will keep you organized and present you with discount coupons whenever they will come up for your products. The service offers free shipping on top of prices that are 20 to 30% lower than what you'd be paying at other online stores. 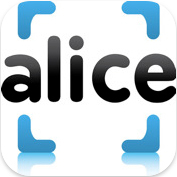 Their iPhone app launched just two weeks ago has already attracted thousands of users and that is mainly because the complete and through service that Alice.com is striving to provide to its users. 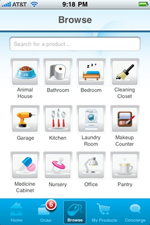 With the iPhone app, you get all the benefits of the online retail store Alice.com from your pocket. 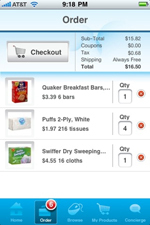 If you already have an account with Alice.com, you can log in right from your iPhone and you will have access to your list manager where you can make ongoing lists of products, access price comparisons, customer reviews, and, of course, add items to your shopping cart and order, always with free shipping. Various coupons and other daily deals are also at the touch of your fingertips, wherever you are. 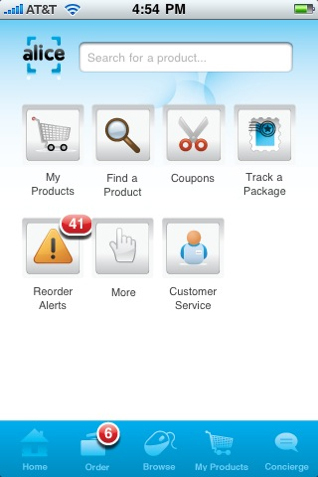 The app is the closest thing I've seen to a e-commerce application for the iPhone. 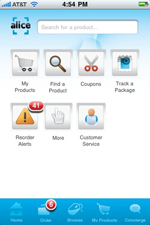 An easy and simple interface that you'll love will let you log in and see your product alerts. You can also search for products and get a detailed description of each, complete with reviews, price comparisons and available coupons. Everything is updated daily, so you're sure to get the latest and best of the offers. The use of the iPhone's real estate is amazing. From a designer's standpoint, you have everything you need to make a purchasing decision, without the screen being cluttered by extra information and details. Icons are representative and easy to navigate through, the app's response time is pretty low. All in all, you're looking at one slick, snappy iPhone app that complements a probable great service online. Alice.com will let manufacturers like Henkel or P&G market their products directly to household consumers, skipping Wal-Mart as a channel of distribution. Household consumers on the other hand can create their household profile (i.e. 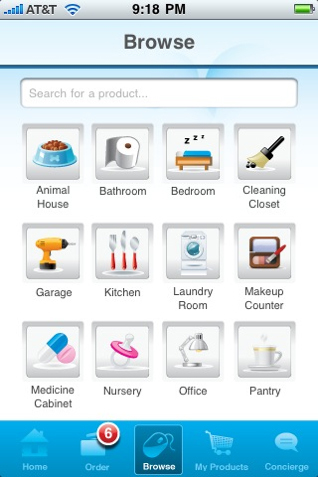 how many adults, children, etc) and let Alice keep track of what's needed in terms of household items. The site will remind users through emails when they're running low, and upon ordering, they will get one single Alice box delivered right at their doorsteps, free shipping, with everything they need in their household. It's not difficult to see why having an iPhone application to go with this service is beneficial to the user. You can take care of all your household shopping requirements when you're on coming home from a business trip, sitting in the doctor's waiting room, or simply have a few moments to spare in the cab-ride home. 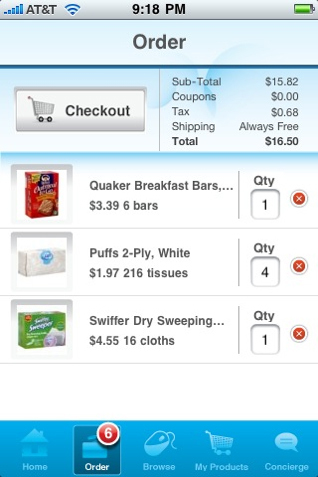 Go paperless and even forget the Shopping lists apps on your iPhone. Alice will simply tell you what you need, before you realize you need it. Everything is done right from your own pocket, anywhere you are. Both the app and the registration on Alice.com are free of charge. What do you think of Alice ? scroll down for our comment section.